Remove swirl marks, polish paint to a high gloss, and machine-apply your favorite wax! Chemical Guys TORQ 10FX Random Orbital Polisher is a lightweight, smooth operating dual action polisher that enables you to remove swirl marks, polish paint to a high gloss, and machine apply your favorite wax or sealant – without fear of damaging your paint! Chemical Guys TORQ 10FX Random Orbital Polisher is a versatile car polisher that delivers the ideal power needed at low speeds, high speeds, and everywhere in between, making it perfect for professionals and beginners alike. You can’t expect to improve the finish of your clear coat paint by using your hands alone. Fact is modern clear coat finishes are HARD and cannot be compounded or polished by hand. Another fact: Chemical Guys TORQ 10FX Random Orbital Polisher is so easy to use that anyone (including beginners!) 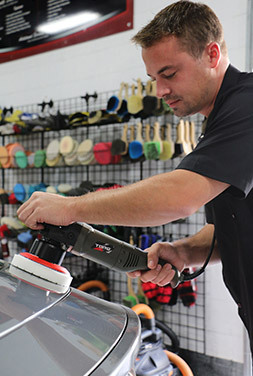 can reap the benefits of this lightweight, powerful dual action random orbital car polisher. Chemical Guys TORQ 10FX Random Orbital Polisher was developed with the beginner in mind, and fine-tuned using feedback from professional detailers that polish paint for a living. 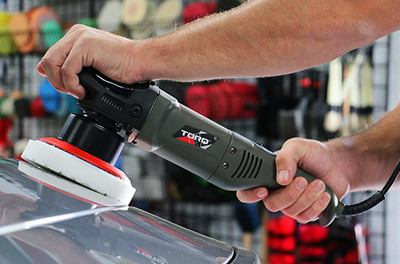 With that in mind, the TORQ 10FX Random Orbital Polisher combines superb ergonomics with a powerful motor that’s capable of removing oxidation, swirl marks and scratches, yet smooth enough to machine apply a wax or sealant. Chemical Guys TORQ 10FX Random Orbital Polisher features vibration reduction technology that significantly reduces fatigue on your arms and wrists, making the TORQ 10FX ideal for long polishing sessions. The easy to read digital display clearly lists the speed setting, and increasing or decreasing speed is easily accomplished with two buttons right below the display. Electronic control systems smoothly increase power upon startup to reduce wear and tear on the motor. Another feature that makes the Chemical Guys TORQ 10FX Random Orbital Polisher a winner its weight, or lack thereof! Chemical Guys TORQ 10FX Random Orbital Polisher weighs a scant 5.5 lbs (that’s not a typo!). Even with a powerful 700 watt motor, the TORQ 10FX is energy efficient, making it perfect for environmentally friendly enthusiasts. Chemical Guys TORQ 10FX Random Orbital Polisher includes TWO 5 inch hook and loop backing plates. One is designed for heavy duty high speed polishing, and the other is flexible, making it ideal for vehicles with lots of curves and contours. Use either backing plate with 5.5 inch Lake Country Hydro-Tech or CCS pads. Polish with precision and experience the amazing capability of a random orbital polisher with the TORQ 10FX by Chemical Guys. Includes two 5 inch backing plates.